The Pope said such a wound cannot be healed by physical barriers, making a case for a more compassionate posture towards migrants. Pope Francis in Rabat cathedral in the Moroccan capital. Pope Francis has described the plights of migrants as a wound that “cries out to heaven”. He made the comment during his visit to Morocco. He says such a wound cannot be healed by physical barriers. Francis made a case for a more compassionate posture towards migrants. Francis seems to be making a case against moves by some western countries especially the United States to build a wall to prevent migrants crossing over. He said “We know too that the consolidation of true peace comes through the pursuit of social justice, which is indispensable for correcting the economic imbalances and political unrest that have always had a major role in generating conflicts and threatening the whole of humanity”. Pope Francis in hand shake with the King of Morocco. Thousands of Africans continue to cross over to Europe through Morocco and other Northern African countries in search of greener pastures. 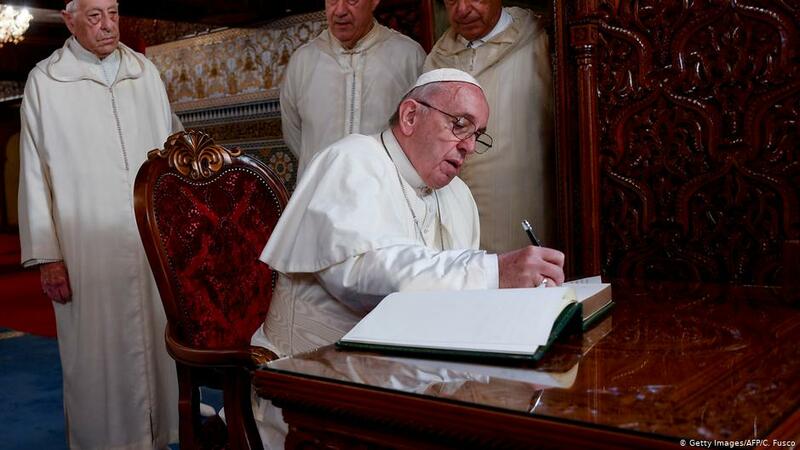 The Pope is hoping resolving economic challenges in poorer countries will be a more sensible approach. On Sunday Pope Francis also encouraged Christians and Muslims in Morocco to leave peacefully. Francis asked Catholic priests and sisters to avoid converting others to Christianity, instead engage in dialogue and charity. 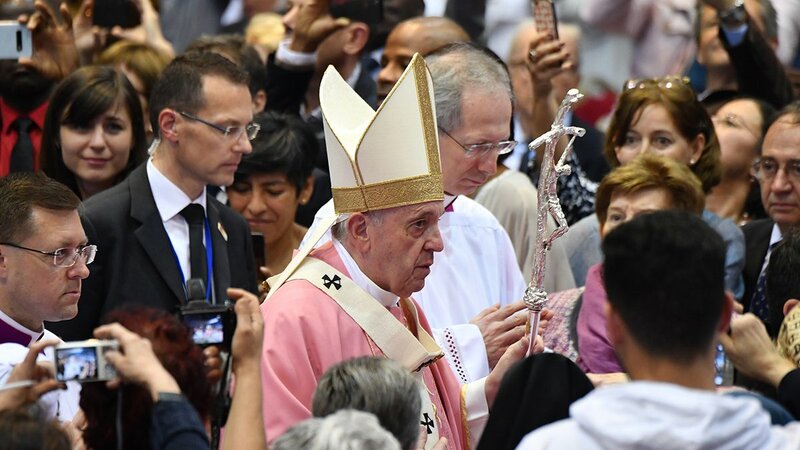 Pope held a mass in Morocco for Christians. 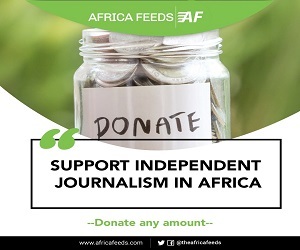 “In this way, you will unmask and lay bare every attempt to exploit differences and ignorance in order to sow fear, hatred and conflict,” he said. 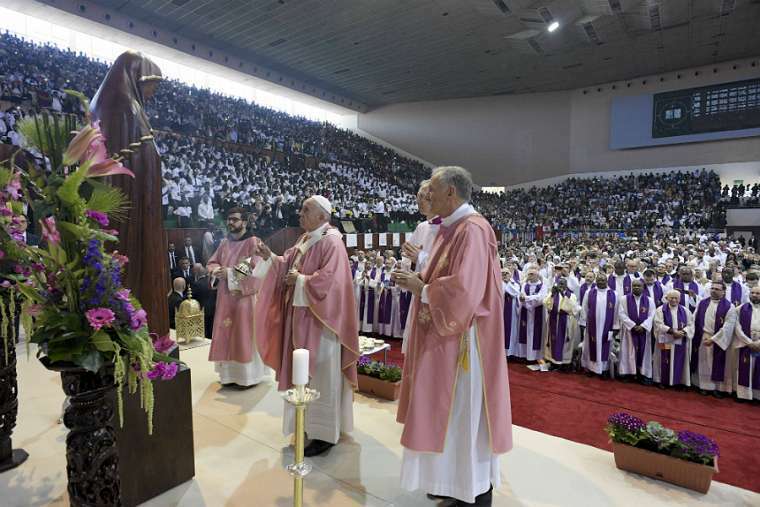 The head of the Catholic faith also celebrated a mass for about 10 000 people. Many of those who attended were migrants from sub-Saharan Africa. Pope Francis was visiting Morocco as the first papal in 34 years. Pope Francis is the first Papal to visit Morocco in 34 years. 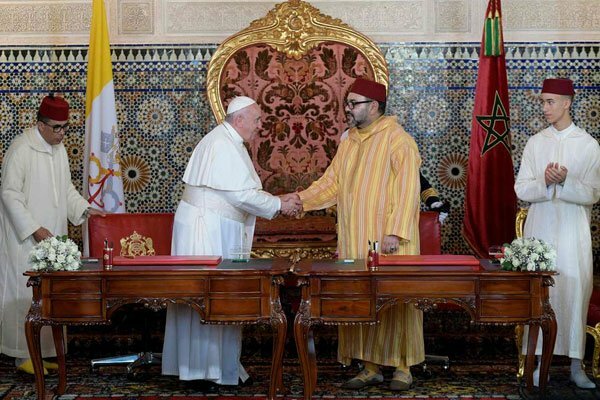 He praised the Moroccan monarch for providing “sound training to combat all forms of extremism, which so often lead to violence and terrorism, and which, in any event, constitute an offence against religion and against God himself”.